TempHeat has 2 full service shops located in Calgary and Edmonton. The Calgary branch has a 5400 sq. 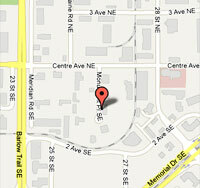 ft. facility and the Edmonton branch is 4800 sq. ft. TempHeat is able to offer a full range of services for the Natural Gas and Propane industry. Propane cylinders can be filled at our branches and we can recertify most propane cylinders of any size (including balloon tanks). We can also repair many problems that are associated with cylinders; such as leaky valves, plugged hoses/lines, faulty regulators, and more. Most services can be done the same day and some can be done while you wait. No appointments are needed as there is usually someone available at all business hours that can help you. Recertifications of cylinders generally take approximately 15 minutes if the cylinder is completely empty of propane. If there is propane in the cylinder, we must first flare off the propane before we can recertify it. This can take anywhere from a couple minutes to a few hours.